In open surgery, the traditional way of performing an operation, surgeons make long cuts through skin, muscle and sometimes bone. Recovery from open surgery can be painful and slow. Some patients may not resume their normal routine for months. Minimally invasive procedures are performed through one or more tiny incisions, with much less trauma to the body. For most patients, this leads to significantly less postoperative pain, a shorter hospital stay, faster recovery, less blood loss, and in some cases, a better overall outcome. Minimally invasive surgery may also allow more people who may not be candidates for open surgery, to undergo surgical repair. 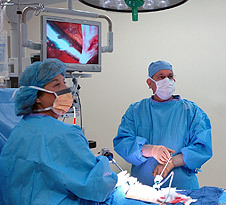 Although laparoscopic techniques vary widely, surgeons generally insert an endoscope, a long thin tube with a lighted camera at its tip, through a small incision. The camera sends a two-dimensional image of the surgical site to a high-definition monitor, which the surgeon watches throughout the operation. Specially designed surgical instruments are placed through the original cut or through other small incisions. The number of incisions depends on the type of surgery, but the trend is to use fewer and shorter incisions. It’s not uncommon for some abdominal operations, such as gallbladder surgery, to be performed through a single incision around the navel. In such cases, patients require only an overnight hospital stay and heal without a scar. Robotic-assisted surgery is an advanced form of minimally invasive surgery. Robotic technology provides magnified, three-dimensional views of the surgical site and gives surgeons greater precision, flexibility and control than is possible with standard laparoscopic instruments and techniques. Important benefits for patients include less blood loss, a considerably faster, less painful recovery and reduced scarring.